Did something memorable happen for your family this year? A significant anniversary (well, of course they all are) or birthday? Did you finally make the decision to make Sarasota your home? Was there a wedding, a birth, or, sadly, a loss you’d like to mark? Commemorate your own personal history with a brick from the historic Seaboard Airline Railroad! celebration for new brick owners. 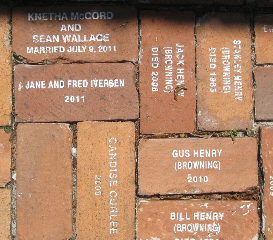 You can honor anyone or any event with an etched historic brick. A donation of $100 or more creates a permanent reminder of your loved ones and highlights your participation in Sarasota History. To inscribe a brick for yourself, to honor a family member or commemorate a life milestone in front of this historic home, simply print out this form. If you’d like to charge your donation to MasterCard or VISA, call Linda Garcia, Site Manager, any weekday between 10 and 2 at 941-364-9076. Questions? Call or email us at hsosc@yahoo.com. This entry was posted in Participate, VIPs and tagged Bidwell-Wood House. Bookmark the permalink.